April 22, 1913 – Portland’s Broadway Bridge opens with great ceremony, becoming the fifth span across the Willamette in Portland, and first to unite North and Northeast Portland with the West side. Link between the North and Westsides. At an elaborate ceremony children exchanged East Side and West Side flags at the middle of the bridge, then threw said flags into the river after being presented with a “Greater Portland” flag. Dignitaries from both sides of town gave speeches as thousands watched and listened from the bridge and the banks of the river. A car parade lined up all the way from Alberta street in anticipation of the bridge opening to traffic. April 23, 1914 – The Suquamish, the first diesel-powered ship built on Puget Sound, is launched from a Seattle shipyard. 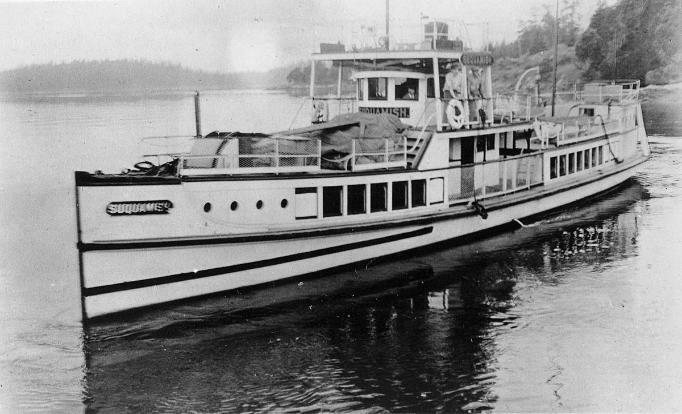 92 feet long and powered by a 180 hp, six-cylinder diesel engine, the Suquamish was designed to carry 175 passengers at 16 knots and was operated by the Kitsap Transportation Company. Before launch the Suquamish was christened by Blanche Thomson, a great-granddaughter of Chief Seattle, the leader of the Duwamish and Suquamish tribes in whose honor Seattle was named. Read more about this historic vessel here! April 24, 1877 – General Oliver O. Howard, newly appointed commander of the U.S. Army’s Department of the Columbia, meets in a day-long council in Wallula, Washington with Smohalla, an influential Wanapum First Nation spiritual leader and advocate of resistance to white culture. Howard and other white authorities blamed Smohalla for promoting discontent among the Frist Nations in the Pacific Northwest, including the Nez Perce band led by Chief Joseph. Howard tells Smohalla he and his followers must move onto the Yakama reservation. However, distracted by the Nez Perce War, which breaks out a few weeks later, Howard takes no steps to enforce the order and Smohalla ignores it. April 25, 1935 – Fire destroys Oregon’s state capitol building. April 26, 1968 – 2,000 citizens march peacefully against the Vietnam War. A photo from a concurrent Cascadian march in Vancouver B.C. describing some of the foundations of that reality. April 27, 2001 – The approval of $35 million in funding from the Department of Housing and Urban Development to the Tacoma Housing Authority allows the leveraging of private resources for a total of $200 million to help replace deteriorating housing units at Tacoma’s Salishan Housing Development. The existing 817 low-income units, built in 1942 as housing for war workers and later returning veterans and military personnel, will be replaced by 1,200 new, subsidized units in a mix of new owner-occupied and rental units, as well as community facilities, a dental clinic, and an education/technology center. April 28, 1917 – Television, film and stage actor Robert O. Cornthwaite is born in Saint Helens, Oregon. Robert Cornthwaite with Nan Leslie in The Californians, 1958. Cornthwaite was a character actor noted for occasional rolls on TV serials such as Batman, Dragnet, The Munsters, The Twilight Zone, and Get Smart, as well as staring in films such as The Thing from Another World (1951) and War of the Worlds (1953). Cornthwaite began his acting career in 1937, appearing in a college production of ‘Twelfth Night’, while attending Reed College in Portland, Oregon. April 29, 1928 – Spokane pioneer aviator Major John T. Fancher is fatally injured by a bomb explosion during an air show in East Wenatchee. As part of his Spokane-based air national guard unit, “Jack” Fancher was participated in an air show as part of Wenatchee’s Apple Blossom Festival, thrilling the crowd during the illuminated night flight by demonstrating some aerial bombing techniques, which consist of throwing grenade-like bombs from the cockpit. After the demonstration, Fancher checks on three bombs which failed to explode. One blows up as he inspects it, blowing off one hand and severely damaging his eye and face. He is rushed to the hospital and dies a few hours later. Within days, the East Wenatchee airfield is named Fancher Field in his honor.